Shy Violet has Fun in the Sun! Oh Sunshine, isn't it miraculous? Sure, the Moon is fabulous too, but the Suuuuuunnnn! It gives us Vitamin D, happiness, warmth, food energy, precipitation and light! It is the reason our gardens grow! The Sun is that special star that is always up there, working, giving, sharing and caring, even on the days we neglect to acknowledge it, it's STILL there giving us LIFE! Amaze-balls! Oh and this little character on my card? Shy Violet, she knows ALL about Sun worshipping! If it wasn't for the Sun, there would be no Violets or life as we know it. Isn't that amazing? I have no idea HOW the world works, how humans breathe air and live on Earth, but one thing is for sure. It's a miracle. You are a miracle. I am a miracle. Your weird neighbor is a miracle. So why did I make this little miracle of a card? 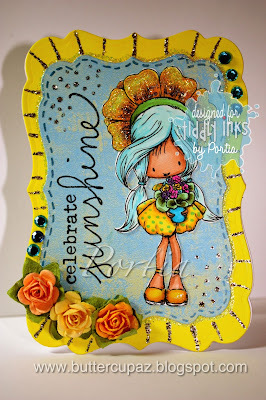 As if you didn't already know, it's for the Tiddly Ink Design Challenge which is to create an image using a Tiddly Ink's digi or stamp, in the theme of "Summer Sun"! My mind immediately went to a beach theme but I resisted the urge and chose to celebrate flowers instead! But don't think I don't love beach themed cards, oh I do! I just wanted to venture into flower land! Today, first of all, Thank You for showing up and checking my little blog out! I appreciate your interest and comments more than you will ever know! :) And second of all, why not acknowledge the Sun today? We can't give the Sun a high-five or a fist bump but we can feel how grateful we are in our hearts for all the Sun does. Sure, when we are unprepared it might burn us or melt our popsicle but for the most part, the Sun is an alright star if you ask me! Know you are always Welcome to join in the Tiddly Ink's Challenges! Have so much fun, know you CAN and you DO make a difference in the world just by being YOU! You could be the Sun in someone's personal solar system and not even KNOW it! Isn't that cool? So, Shine Bright, go forth and spread the light! Molly is the cutest! Here's a little make I made for Anything Goes with Tiddly Inks! Thank You for stopping by! I have to run to rehearsal right now, hopefully I'll add more to this post later gator! 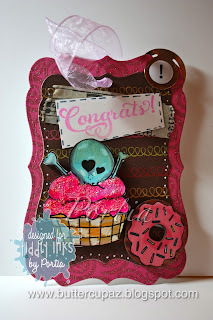 Make it Pop with Tiddly Inks Challenge! Hello Everyone and Welcome to today's post! At Tiddly Inks we are celebrating 3D effects with our Make it Pop Challenge! You are invited to join in! All you need to do to participate is to make a new make, (card, tag, gift bag, scrap page, journal entry etc.) using a Tiddly Ink's image and some sort of 3D "POP" effect! I went with Foam Dots under my cupcake image to make that pop! I hope you enjoy my little tag and find some inspo!!! It doesn't have to be elaborate, just have fun with your make!